PHOENIX — Federal prosecutors who secured a criminal-contempt conviction against former Sheriff Joe Arpaio effectively relinquished their win on Monday, saying President Trump’s pardon has nullified the verdict. But the pardon has also galvanized a slate of non-profits and constitutional attorneys, all who are urging a federal judge to uphold Arpaio’s conviction. At least four separate coalitions have now filed motions opposing the pardon. In a federal court filing Monday morning, Department of Justice prosecutors agreed with Arpaio’s defense attorneys, who asked U.S. District Judge Susan Bolton to toss Arpaio’s case following the Aug. 25 pardon. Bolton canceled the Oct. 5 sentencing after the pardon, but stopped short of dismissing the case. She instead ordered both Arpaio and DOJ prosecutors to file briefs on why she should or shouldn’t grant Arpaio’s request to vacate. Arpaio, a political ally and longtime Trump champion, was the recipient of Trump’s first presidential pardon. The announcement came less than a month after Bolton found Arpaio guilty of flouting a federal judge’s orders in a racial-profiling case. 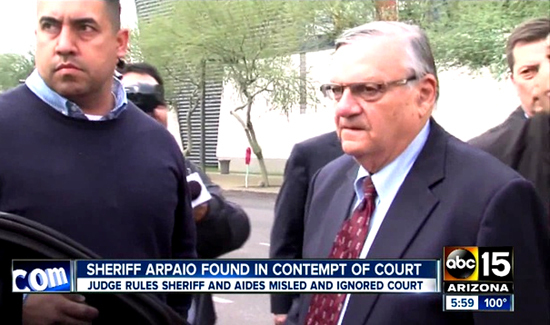 Arpaio was just enforcing law that the feds wouldn’t. Under Obama, the feds abdicated their legal duty and their responsibility for immigration enforcement. The sheriff was merely honoring his oath and protecting the citizens of his county.